Hello, and welcome back to another session of the North Dakota Legislature! As a means of introduction, my name is Kelly Hagen, and I am your North Dakota United communications director. I’ve been with NDU since our merger in 2013, and previous to that I was communications specialist for the North Dakota Public Employees Association. So, the 2019 Legislative Assembly is my fifth legislative session and latest attempt at keeping as many of our members informed regularly as to what we see happening at the Capitol. It’s happy work, I assure you. I am, by no means, alone in this effort. Last legislative session, we had NDU’s director of public affairs, Tom Gerhardt, writing these weekly Legislative Updates. Tom is your eyes and ears at the Capitol still, and provides regular updates from the Legislature on our Twitter account, www.twitter.com/ndunited. He also dives deep into what we’re seeing each week on our Legislative Update live broadcast on Facebook, each Friday afternoon, along with NDU President Nick Archuleta. Be sure to tune in each week live as it happens or watch the archived video anytime on our Facebook in the Videos section. For all of our tremendous educators and public employees in the state, their video broadcast is easily the fullest, best and most informative look into legislation coming out of Bismarck during the session that affects our public workers, education and services in the state of North Dakota. Our legislative team also includes executive director Chad Oban, special sections coordinator Sarah Keiser-Johnson, field consultant Jane Rupprecht and lobbyist Bob Marthaller. And then there is this, the written recap of what they talk about each week. Everyone likes to digest information in different forms; this written update will be posted on our website every week on Mondays, and will also be sent directly to you through our weekly NDUpdate e-newsletter, and on our social media accounts. Any tips, comments or complaints can be sent to my e-mail at kelly.hagen@ndunited.org. By all means, let me know your thoughts about all there is to talk about during session. And let’s have some fun with it too, because what else is there to do? Weep hysterically? I mean, that’s always an option, but let’s keep that one in our back pocket for now. Always start on a downer. That’s what my grandfather used to tell me. 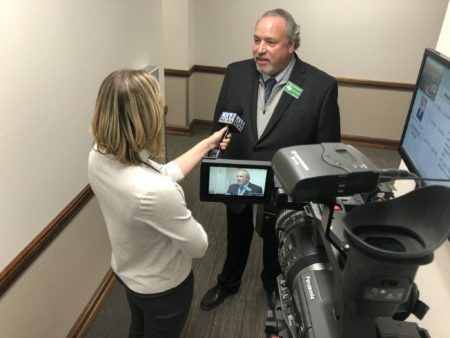 ND United President Nick Archuleta gives comments to the media in opposition to SB 2034. Next, let’s look at some bills to allow guns in schools. HB 1325 would allow anyone over the age of 18 to conceal carry firearms into school and public buildings, in conjunction with SB 2034, which amends who is exempt from law, if passed. HB 1310 allows anyone 21 and over to conceal carry. HB 1332 is similar to legislation in past sessions that would allow school personnel to conceal carry guns in schools. We were against them then, and will remain opposed during this session. Each week, we’d like to ask all of you to help ND United to make our voices heard on an important issue. To start things off, we would like to call HB 1347 to your attention. This bill would extend probationary periods for beginning teachers from one year to three years and would remove the right of teachers to have representation and a face-to-face meeting with school board members when they are being let go. At a time when teacher shortages are abundant in our state and across the country, and it’s becoming increasingly difficult to recruit new educators into the field of education, making it even easier to fire them without cause or explanation is not the answer. Clearly. Let’s also talk about everyone’s favorite subject: pensions. Retirement security is a good thing, and important recruitment and retention tool for educators and public employees in our state. Enter: HB 1419, which would ultimately throw out state pension plans and replace them with 401(k)-style plans. Three Senate bills would also affect pensions; two of which we oppose, and one we support. SB 2046 would end the Employee Health Insurance Credit, and we do not support degrading benefits for our members. Ever. 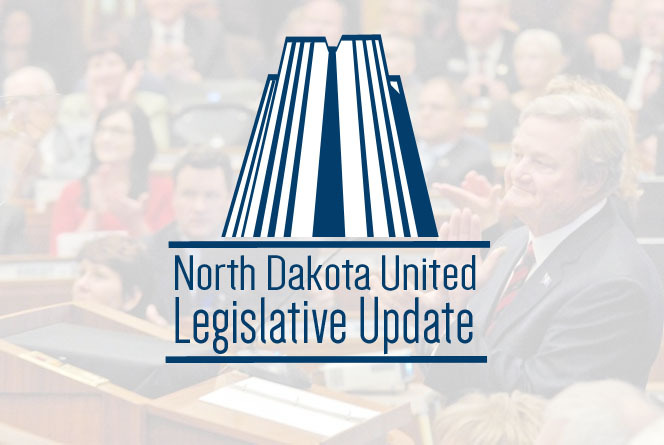 SB 2048 would increase employee and employer contributions into NDPERS by 1 percent, which is an idea our association has supported since it was first brought up years ago. This will help return the NDPERS fund to being fully funded in a gradual, responsible manner. And then there is SB 2047, which would decrease the multiplier of the PERS plan from 2.0 to 1.75. The multiplier is what determines your benefit upon retirement, multiplying your years of service by that number to determine what percentage of your salary you receive in retirement. That’s degrading a benefit that our public employees have worked hard to earn, and we stand firmly against. HB 1208 — “Relating to the creation of a teacher reimbursement program; to provide an appropriation; and to provide for a transfer.” Teachers would receive up to $200 per year in reimbursement for school supplies you’re buying out of pocket currently. Nice! Support. SB 2217 — “Relating to a teacher incentives for leadership in education program; and to provide for an exemption.” We support this idea, which would help identify great teachers and help bring them along as professionals in education. Support. 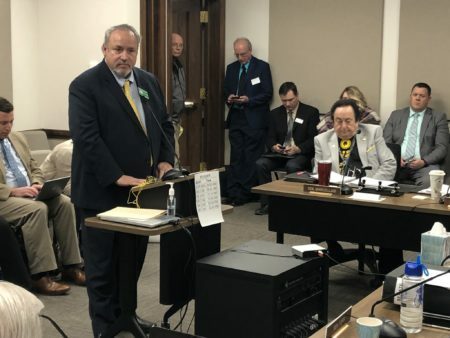 SB 2128 — “To provide a statement of legislative intent regarding state employee compensation adjustments.” This bill would increase state employee compensation by $300 per month, or $3,600 in the first year, and by an equal percentage-based amount in the second year of the next biennium. After no increases in state-worker pay during the last two years, it is time to increase compensation for our hard-working state employees. Support. SCR 4004 — “To consider studying the impact of violent, disruptive, and inappropriate behavior within the educational environment perpetrated by students against other students, teachers, and other school personnel, and the need to implement a uniform reporting system.” We had two Fargo teachers testify in support of this bill, and be sure to check out their remarks they gave to our Facebook page directly after giving their testimony. Support. SB 2132 — “Relating to state contribution for the uniform group insurance program; to provide for application; to provide an effective date; and to declare an emergency.” This bill was meant to reduce the family health insurance coverage for state employees to single coverage. Good news, though! It received a unanimous “do not pass” recommendation in committee, and was defeated 45-1 on the floor of the Senate. See? Good things happen, sometimes. Oppose. ND United President Nick Archuleta testifies against SB 2142 for school vouchers. SB 2142 — It’s a voucher bill; I’m not going to share the “education savings account” text in the bill concerning drafters’ intent. We do not oppose school choice, however we do strongly oppose giving public funds to private schools. Oppose. SB 2025 — “Relating to the duty of the superintendent of public instruction to review the statewide education strategic vision; and provide reports to the legislative assembly and legislative management.” All of the education stakeholders are invested into this plan, to cut out duplication of services and make sure everyone is pulling in the same direction. Support. So, yeah. That was a whole lot, and there’s a lot more coming. We’ll be providing as much information as we can on our website at www.ndunited.org and on social media. We also urge you also to sign up for our NDU Member Activist list at https://www.ndunited.org/issues-action/be-an-nd-united-activist/ . Everyone on that list is contacted first with Action Alerts, via e-mail and text messaging, with forms and actions we need taken to support good legislation and defeat bad ideas. Sign up now, and I’ll see you back here again next week!